Helena Claire A. Canayong, fondly known as Wimwim, is a graduate of the University of the Philippines in the Visayans with a Bachelors of Arts in Social Sciences major in Economics, and she earned her Masters in Business Administration at the International Academy for Economics and Management. During her final year in college she volunteered as a research and training assistant for an NGO, and after graduation served as the Research and Training Specialist for Micro-Enterprise Development and also worked as an Administrative and Finance Officer. Wimwim served as VFV’s Community Program Coordinator for seven years and oversaw all programs and offerings in both the local community and outreach projects. Wimwim is best known for initiating one of VFV’s most successful welfare projects that rehabilitates youths at the garbage dump site north of Tacloban. In February 2013, Wimwim became the Director of Operations for Volunteer for the Visayans; she is now tasked with leading Volunteer for the Visayans and directing their services, while she promotes the organization’s primary mission and vision. Laila Uyvico is a graduate of AMA Computer University with a Bachelor of Science Degree in Computer Science. Laila joined Volunteer for the Visayans in 2012 after working previously as an Accounting Assistant and Administrative Registrar for other companies. Today Laila undergoes the busy task of ensuring that all of the organization’s financial and administrative tasks are processed – a crucial role in the life cycle of an NGO. Aside from this, Laila provides cross-program support by assisting VFV’s Volunteer, Sponsorship, and Community Programs as needed. Merynie Maceda is a graduate of STI (Science Technology of Institute) with an Associate Degree in Hospitality Restaurant Services. Merynie was a local volunteer for 5 months were she assisted our international volunteers with the Nutrition Project and profiling of children. She also assisted with the Community Projects such as the Adopt-a-School, Boys and Girls club and some special projects. Currently, she handles the Mothers Club every Thursday and one of our Office Assistant who oversees the liquidations of the staff and some paperworks. Salvacion Noquera started last 2007 as a local volunteer assisting with the Community Feeding here in our Bliss community center. She is also one of the first member of the Mothers Club and later chosen as a member of the Laura’s Craft. Together, with the help of her fellow members they made different kinds of crafts like flowers made from paper, ladies bags, school bags of our sponsored children were most importantly they also help with the environment by recycling. Currently, she is now responsible for the preparation of the Nutrition Project for our sponsored children residing here in Bliss and in the surrounding communities and also helps with the beautification and cleanliness of our community center. She also provides cross program support by assisting VFV’s Volunteer, Sponsorship and Community Program when needed. Judelito Sorilo Bersoza is a graduate of the University of the Philippines Tacloban College with Bachelor of Business Administration in Management. “Jude”, as fondly known to his family and friends, had his previous employment in a government-owned and controlled corporation as a marketing staff. 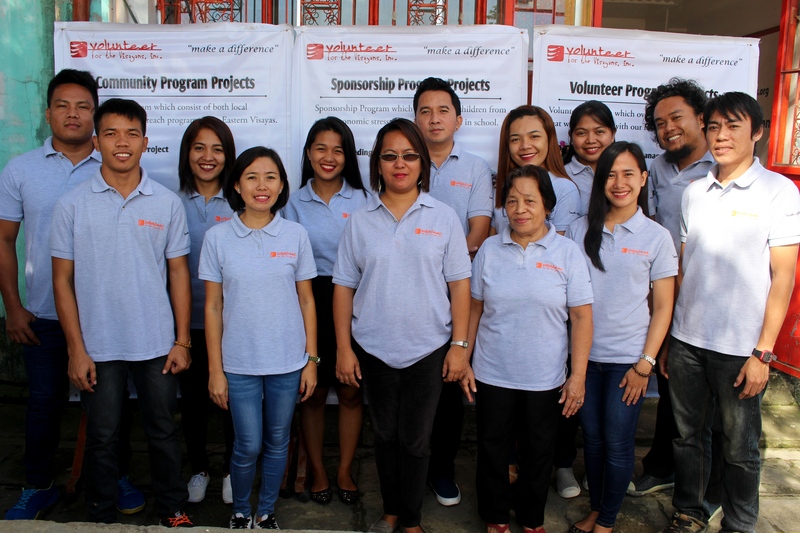 Having witnessed and experienced the devastation brought by supertyphoon Yolanda to the lives of the people in Visayas, he never hesitated lending a hand to volunteers when the opportunity came, hence his involvement in VFV. Jude is responsible for looking after international and local volunteers alike. He also assists in the program orientation, city tour, placement orientation and basic waray-waray lessons for volunteers. He also does some of VFV’s social media campaigns. Aleth Young is a graduate of Asian Development Foundation College with a degree in Bachelor of Science in Hotel and Restaurant Management. He is responsible for picking up and sending off volunteer from and to the DZR Airport, looking after international and local volunteers, as well as coordinating with the local community placements for volunteers. He is also responsible for the orientation, city tour, placement orientation and basic waray-waray lessons for volunteers. Also responsible for gathering internet tools as well as social media and VFV website. Crisel Macabare is a graduate from Leyte Normal University with a Bachelors Degree in Elementary Education major in General Education. She had her license as Professional Teacher on year 2008 after passing the Teachers Board Exam. Prior to being appointed as a Sponsorship Coordinator, Crisel was a local volunteer for VFV, working on both the Volunteer and Child Sponsorship Programs. Today, Crisel assists the Sponsorship Program in providing social welfare services for over 170 disadvantaged children. Aside from this she is also responsible for coordinating weekend tutorials for sponsored children in Bliss and assisting with communication with international child sponsors, as well as conducting interviews and updating sponsor child profile. Jeremey B. Picardal is a graduate of Asian Development Foundation College with a Bachelors Degree in Education major in Filipino. He was a former sponsored child for 11 years, former VFV college scholar and a former scavenger at the local dumpsite for 9 years. Currently, he is now one of the VFV staff and a Sponsorship Program Coordinator assisting the lead coordinator in providing social welfare services to our 170 sponsored children from the surrounding towns of Tacloban City. He also assist with the activities of our children and as well helping with the subsidy distribution. John Balanlay is a former die-hard local volunteer who conveniently lives next door to our community center in Bliss, Sagkahan. Today he is responsible for working as the Community Program Coordinator and helps oversee and assist operations for the Dumpsite Project, the Nutrition Project, and several of VFV’s Local Community Clubs. John regularly works alongside international volunteers and helps to spread awareness and understanding of VFV’s projects amongst volunteer participants. In his spare time John likes to sit back, reflect on philosophy, and drink a big mug of coffee.